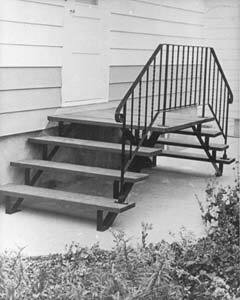 Steel Step Frames in Conventional, Side and Crossover Step Frames. 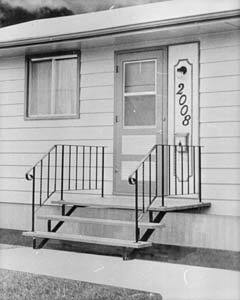 Artistic Iron Works in, Regina, Saskatchewan, Canada is a supplier of easy to assemble, do-it-yourself steel step frames available in conventional, side and crossover styles. 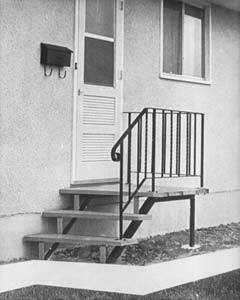 Artistic Iron Works in, Regina, Saskatchewan, Canada is a supplier of easy to assemble, do-it-yourself steel step frames available in conventional, side and crossover styles. You can build a complete set of steps with these "STEP FRAMES". They are available in three types as shown below. Each type is available in 2 to 9 risers. These frames are manufactured with 2 x 2 x 3/16 angle iron and 2 x 3/16 flat iron and are predrilled to accommodate 2 x 6 or 2 x 12 planks. Artistic Steps are easy to install... simply bolt step frames to the floor joist, (3 ft. apart). Bolt front of step to the sidewalk, piles or blocks. Bolt planks to the step frames, 4 on the landing and 1 for each tread. Now bolt the railings to the planks to complete your step. A coat of paint should now be applied. Step frames are drilled for 2 x 12 or 2 x 6 planks. Hardware supplied with frames. Artistic Steps are easy to install... simply bolt one step frame to the floor joist. Bolt other frame to the sidewalk, piles or blocks. Set frames 3 ft. apart. Now bolt planks to the step frames, 5 on the landing and 1 for each tread (planks must be cut 48" long). Now bolt the railings to the planks to complete your step. A coat of paint should now be applied. Artistic Steps are easy to install... simply bolt one step frame to the floor joist, bolt other frame to the sidewalk, piles or blocks. Set frames 3 ft. apart. Bolt planks to the step frames, 5 on the landing and 1 for each tread (Cut planks 48" long). Now bolt the railing to the planks to complete your step. A coat of paint should now be applied.